We’d love your help. Let us know what’s wrong with this preview of The January Dancer by Michael Flynn. A triumph of the New Space Opera: fast, complicated, wonder-filled! Hugo Award finalist and Robert A. Heinlein Award-winning SF writer Michael Flynn now turns to space opera with stunningly successful results. Full of rich echoes of space opera classics from Doc Smith to Cordwainer Smith, "The January Dancer" tells the fateful story of an ancient pre-human artifact of grea A triumph of the New Space Opera: fast, complicated, wonder-filled! Hugo Award finalist and Robert A. Heinlein Award-winning SF writer Michael Flynn now turns to space opera with stunningly successful results. Full of rich echoes of space opera classics from Doc Smith to Cordwainer Smith, "The January Dancer" tells the fateful story of an ancient pre-human artifact of great power, and the people who found it. To ask other readers questions about The January Dancer, please sign up. I totally recommend this novel for the wild and weird adventure of the Immovable Force, aka the Dancer as it bends the wills and minds of entire civilizations, the world-building of the Rift, a lawless portion of space and it's civil war and so oddly Irish characters, and the sense that so much is going on that it's really hard to follow the enormity of it. Drunks, I don't know about this one. I mean, it feels pretty awesome on so many levels, and yet the characters kinda fell a bit flat for me. 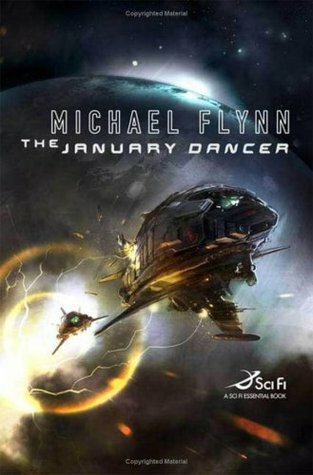 _The January Dancer_ is a very good space opera…I wish it had tipped over into great. There is a lot going on here to love: a sufficiently deep future history created through the liberal use of allusion that references any number of existing earth cultures (heavily relying on Celtic and cultures from the Indian subcontinent) along with some pretty swell creations of Flynn’s own (the Hounds, ‘those of Name’, the Terran Corners, the Rift, the People of Sand & Iron, etc.) in which the diaspora of humanity has settled across the cosmos, making use of an intriguingly pseudo-scientific explanation for FTL travel; a cast of varied and interesting characters of disparate parts coming together, as though by chance, to solve the mystery of a powerful pre-human artifact; and perhaps most of all the well-crafted prose of Michael Flynn that provides a certain shine to what might have been little more than a bloated pulp epic in weaker hands. And yet I just didn’t find myself utterly captivated by the story as I hoped I might. Somehow it felt as though I was being held at arm’s length from the narrative and I was unable to fully immerse myself into this world as I have done in Herbert’s Dune, Zindell’s Neverness, or Simmons’ Hyperion. Perhaps it was Flynn’s use of a dual narrative structure in which the main story was a tale being told by a character in another narrating arc, but I don’t think that’s it: I am not averse to the technique (indeed it’s not unlike that used by Simmons’ in _Hyperion_) and I don’t think Flynn did a bad job in making it work. Perhaps the story was too much of an obvious set-up for the required sequels. There was a lot happening, but so much of it was seemingly to get the board into a state of readiness for the game to *really* proceed that it might have made the story of this volume itself seem weak, unable to support its own weight. Whatever the case may be, I did quite like the story Flynn had to tell, but I just wanted to love it more. We follow the wanderings of a group of characters as they in turn follow the peregrinations of an alien artifact able to change its shape imperceptibly (and may have other, less benign powers) that was discovered by the tramp freighter captain Amos January (hence its name, The January Dancer) as it moves from hand to hand across large swathes of known human space. As various players from different factions come across the Dancer (or rumours of it) a race to attain the hidden power of the alien artifact begins. We are given a tour of many of the main worlds that make up the loose conglomeration of planets known as the United League of the Periphery (under the nominal control of the Ardry of High Tara and his specially trained police force, the Hounds) whose great enemy, the Confederation of Central Worlds (in which is held the lost home-world of Old Earth), lies watching and waiting across the great galactic rift. As you may have surmised, I very much enjoyed this space opera. It reminded me a bit of Iain Banks' Culture books in the irreverent style of writing and the variety of worlds Fly I'm torn between giving this 3 or 4 stars (for the moment, I've settled on 3). It's definitely more than 3 but I want a few more days to pass while I digest the book because I've read a few lackluster efforts recently and I want to be sure I'm just not overcompensating for finally finding something worth reading and fun. This is the second book I've read by Michael Flynn, the first being Eifelheim. Both Eifelheim and The January Dancer have beautifully written, well crafted, and practically self-propelling stories taking place in vivid settings at once alien and familiar, with characters you believe and characters you don't, and you're not always sure which is which. And in both books Flynn feels the need to interrupt those gorgeous main stories multiple times with secondary plotlines. It seems apparent that the This is the second book I've read by Michael Flynn, the first being Eifelheim. Both Eifelheim and The January Dancer have beautifully written, well crafted, and practically self-propelling stories taking place in vivid settings at once alien and familiar, with characters you believe and characters you don't, and you're not always sure which is which. And in both books Flynn feels the need to interrupt those gorgeous main stories multiple times with secondary plotlines. It seems apparent that the secondary plots are intended to tease more meaning from the main stories, even to help drive the main stories along their intended paths. But the effect on me of the secondary plotlines, in both instances, was nothing more than a series of unwanted interruptions. Think commercial advertisements interrupting your favorite TV drama (before the days of the DVR, of course). Now, admittedly, I’ve only read a small sample size of Michael Flynn’s work (just two out of ten novels). So it’s not like I can make a generalized statement about his tendencies as an author. But I’ve read two of his more loved books, and in two out of two cases he made the same mistake, namely, not trusting his own storytelling ability. Flynn can weave a damned fine yarn, there’s no doubt about that, and then it seems he wants to take that one extra step to perfect his novel ... and it’s a step both unnecessary and counterproductive. Like a painter or a songwriter or any other artist, Flynn needs to learn to leave well enough alone. Nothing will ever be perfect, but some works can be darned near so, and that extra step in the strive for perfection can take one backwards. The interruptions in The January Dancer were the extra brushstroke that ruins a beautiful picture. They weren’t needed to advance the story, as the story itself was powerful and interesting enough to advance itself, and what little information they contained could have been revealed through the main story, instead of outside of it. If Flynn really felt the secondary story was necessary, he could have done a prologue and an epilogue, with maybe one brief interregnum in the middle; I found myself dreading the constant interruptions before every (relatively) short chapter. But enough of my complaints. As I’ve indicated, the main storyline is something to behold. The characters themselves are not the deepest I’ve seen (not like the priest in Eifelheim, for example), but they’re deep enough; the main four or five are far from two-dimensional. The story itself has enough twists and turns and slippery slopes to prevent you from ever quite grasping it (a little double-meaning for those of you who’ve read it) until all the pieces are revealed. The pacing is expert, picking up where it needs to pick up and slowing where you need a rest (not counted the aforementioned unwanted hiccups), and the worlds across which the story dances are more than just hopscotch squares, with cultures and histories of their own. If I had it to do over again (and I know there can only ever be one first time with a book, just like there’s only one first kiss with a lover) I’d simply ignore the interruptions and let the story of The Dancer carry me away. 4.5 to 5.0 stars. A superb and original space opera that is incredibly well written. The world-building is excellent, the characters are dynamic and very well drawn and the plot is intelligent, complex and terrific. If you are looking for smart, original space opera than you have found it. Highly Recommended!!! I feel like there are very few moments when it is not a mistake to have a character or the narrator declaim about the intrinsic difference between men and women, particularly when it's used lazily to limit women's emotional range. When it's off the cuff, that's annoying. When it then goes on to shape the women characters in the book because apparently that's really what the author thinks about women, then the irritation grows. Note: The rest of this review has been withheld due to the changes in I feel like there are very few moments when it is not a mistake to have a character or the narrator declaim about the intrinsic difference between men and women, particularly when it's used lazily to limit women's emotional range. When it's off the cuff, that's annoying. When it then goes on to shape the women characters in the book because apparently that's really what the author thinks about women, then the irritation grows. I should have loved this one but didn't. Maybe another day. Michael Flynn's Eifelheim is one of my favorite science fiction novels. It takes SF in a direction I'd never seen SF go before. So, when I heard about The January Dancer, I was very anxious to read it and delighted when I found it on the shelves at my library. I thought The January Dancer was a beautifully written, very creative story. I really enjoyed the way Flynn created a future that involved humans from different planets talking in different dialects. I like how he brought the different pla Michael Flynn's Eifelheim is one of my favorite science fiction novels. It takes SF in a direction I'd never seen SF go before. So, when I heard about The January Dancer, I was very anxious to read it and delighted when I found it on the shelves at my library. I thought The January Dancer was a beautifully written, very creative story. I really enjoyed the way Flynn created a future that involved humans from different planets talking in different dialects. I like how he brought the different planets and their citizens to life. I liked how he framed the novel as a man telling a harpist the story of the pursuit of a pre-human artifact so she can create a piece of music about it. As much as I liked Flynn's creation though, I couldn't give it more than three stars because I just didn't know what the heck was going on most of the time. I lost track of the narrative threads more times than I can count and the characters all had so many names that I couldn't keep them straight. I'm a fan of Michael Flynn. I've enjoyed six of his novels and I expect to read many more. This particular book is well-written, and I wouldn't discourage other science fiction fans from giving it a try, but it didn't suit me at all. My one-star rating means "I didn't like it", not "It's a terrible book." I'll forgive a lot if the writing is good, but with this book there seemed to be more style than substance. At the halfway point I realized that I didn't care about any of the characters, I didn I'm a fan of Michael Flynn. I've enjoyed six of his novels and I expect to read many more. This particular book is well-written, and I wouldn't discourage other science fiction fans from giving it a try, but it didn't suit me at all. My one-star rating means "I didn't like it", not "It's a terrible book." Everything in the universe is older than it seems. Blame Einstein for that. We see what a thing was when the light left it, and that was long ago. Nothing in the night sky is contemporary, not to us, not to one another. Ancient stars exploded into ruin before their sparkle ever caught our eyes; those glimpsed in glowing "nurseries" were cronies before we witnessed their birth. Everything we marvel at is already gone. Yet, light rays go out forever, so that everything grown old and decayed retains somewhere the appearance of its youth. The universe is full of ghosts. A fable set in mythical Ireland in the far future, only it's a spy story. I can't make that sound any less ridiculous, but it's played perfectly straight and it works great. Humanity's first interstellar civilization was forcibly diaspora'd; a millennium later, the fragments have rebuilt an uneasy cluster of stellar nations while clinging to their mish-mash of half-remembered Terran history. Result: people with names like Ringbao della Costa think it's perfectly natural to write "Little Hugh O'C A fable set in mythical Ireland in the far future, only it's a spy story. I can't make that sound any less ridiculous, but it's played perfectly straight and it works great. Humanity's first interstellar civilization was forcibly diaspora'd; a millennium later, the fragments have rebuilt an uneasy cluster of stellar nations while clinging to their mish-mash of half-remembered Terran history. Result: people with names like Ringbao della Costa think it's perfectly natural to write "Little Hugh O'Carroll" on the office door when they go to work for the government of New Eireann -- it's not deception, it's just good manners. As I said about Joe Abercrombie after reading THE HEROES not to long ago, "where has THIS guy been all this time? I want more!" With that encouraging start, The January Dancer (henceforth TJD) is the first story in a Space Opera series called "The Spiral Arm". I've seen reference to Michael Flynn in relation to what is being called "the New Space Opera", which, I suppose lumps him in with the late great Iain Banks and other writers. There was not that much "new" about this Space Opera, it was a As I said about Joe Abercrombie after reading THE HEROES not to long ago, "where has THIS guy been all this time? I want more!" With that encouraging start, The January Dancer (henceforth TJD) is the first story in a Space Opera series called "The Spiral Arm". I've seen reference to Michael Flynn in relation to what is being called "the New Space Opera", which, I suppose lumps him in with the late great Iain Banks and other writers. There was not that much "new" about this Space Opera, it was a classic MacGuffin story with twists, betrayals, galactic empires, agents, space cops and space pirates. What's not to love? "Everything in the universe is older than it seems. Blame Einstein for that. We see what a thing was when the light left it, and that was long ago. Nothing in the night sky is contemporary, not to us, not to one Finished? Well, not quite. "Everything in the universe is older than it seems. Blame Einstein for that. We see what a thing was when the light left it, and that was long ago. Nothing in the night sky is contemporary, not to us, not to one another. Ancient stars explode into ruin before their sparkle ever caught our eyes; those glimpsed in glowing "nurseries" were crones before we witnessed their birth. Everything we marvel at is already gone." The voice in the above has a nice sparkle to it, easy to engage with, and ringing with the kind of truth that makes this reader, nod and go, "Yeah, that's so true." The beginning also holds tremendous promise. In a scene vaguely reminiscent of something from Firefly/Serenity, the crew of a spaceship barely escape from a dangerous planet, once the home to a long gone, but powerful elder race. Unfortunately, it's not representative of the rest of the novel. To be blunt, the author seems a little to enamored with clever turns of phrase to the point where eloquent moves into a garish shade of purple. Individually, many of the sentences in the narrative are pretty, but put together, there is no flow. It's awkward and difficult to read. Clunky. Worse yet, there is an absolute dearth of characterization. Every character has at least two aliases, names that are used willy-nilly. I suppose this is intended to give the impression that no one is who they seem to be. Bleck! Buried in fluffy prose and with no particularly distinguishing features, everyone blurs into the incomprehensible background tapestry of techno-science-babble. The plot, meanwhile, what I can discern of it, meanders between a wandering minstrel who is interviewing a key figure in the story (I think he's key), and various parties in the story, at various points in time. If it were interesting, it would be dizzying. Alas, it's more mind numbing than a truckload of sedatives. I'm not going to attribute my enjoyment of this novel to a definite craving for good space opera science fiction, because aside from that fact, it's simply an excellent piece of story-telling set in an intriguing and original far-future universe that could host many more good novels in the future. I hope Flynn will decide to write them. The novel's framing story is mostly set in an inn. A mysterious harper has tracked down a man for a story. As he tells the story about the Dancer, an alien artifa I'm not going to attribute my enjoyment of this novel to a definite craving for good space opera science fiction, because aside from that fact, it's simply an excellent piece of story-telling set in an intriguing and original far-future universe that could host many more good novels in the future. I hope Flynn will decide to write them. The novel's framing story is mostly set in an inn. A mysterious harper has tracked down a man for a story. As he tells the story about the Dancer, an alien artifact accidentally discovered by a starfreighter captain, we learn more about the history and ways of the United League of the Periphery, an interstellar society connected by faster-than-light highways. Between the chapters, the harper and the story-teller bicker, eat and drink, and talk --- all the while adding to the over-all picture. The author is amazingly deft at telling a fascinating story - at its most basic level a very complicated chase after the Dancer - while slowly making the reader get a more accurate view of the Periphery's history. One odd but charming aspect of the novel is that, while it's undeniably science fiction, so many of its features resemble fantasy: not just the cliche of strangers meeting in an inn to listen to a harper and hear stories, but also the artifact's magical-seeming nature and the names of the space-highways (the Palisades, the Silk Road) and the police force (Hounds are almost super-human-seeming agents with military, detective and spy-like aspects). Aside from the entertaining story line and the well-drawn characters, I really enjoyed the way Flynn described the Terran parts of society --- Terrans are a lower class in the Periphery, with their own ghettos on every planet, secret councils of leaders, and even their own lingo (a barely understandable jumble of several languages). This is an excellent piece of SF, and as mentioned before, I really hope Flynn will write more stories in this universe. Four stars! I don't think I ever labelled a book "pretentious" before, so this will be a first. But that is precisely what this story is: pretentious. It is filled with self-righteous characters strutting about and emoting about their own importance (imagined or otherwise) quite a bit, but when all was said and done, I felt that this was a story filled with sound and fury that signified nothing. Now, it was NOT a tale told by an idiot: the basic story is a good one: an alien artifact that can bend the will I don't think I ever labelled a book "pretentious" before, so this will be a first. But that is precisely what this story is: pretentious. It is filled with self-righteous characters strutting about and emoting about their own importance (imagined or otherwise) quite a bit, but when all was said and done, I felt that this was a story filled with sound and fury that signified nothing. Now, it was NOT a tale told by an idiot: the basic story is a good one: an alien artifact that can bend the will of others is discovered on a planet (by a Captain January, hence the title), something that results in a wild chase by various galactic powers attempting to control it. Unfortunately, this interesting premise is constantly sidetracked by the book's various characters (comprised of rather boastful but forgettable individuals such as the femme fatale secret agent, the manly secret agent, the charismatic Irishman who is always on the run for some reason, an Earthling who speaks in broken English, that other guy...see my point?) whom often seem interested in everything BUT the alien artifact, something that results in a lot of tangential events that serve to bring the central story to an almost complete halt at times. Sadly, the story's resolution ultimately arrives as almost an afterthought rather than a satisfying payoff. In the tradition of MJ Harrison Light and told with the detached ironical tone of the author's The Wreck of the River of Stars this is a superb literary space opera novel. Written in a Celtic-laden language which gives it an archaic feel that complements its far future, space opera setting, The January Dancer tells the story of "how the Universe went insane" once an obscure crew member of a down-on-luck tramp freighter stopping on a nameless world for repairs, shifts a backhoe and touches a st In the tradition of MJ Harrison Light and told with the detached ironical tone of the author's The Wreck of the River of Stars this is a superb literary space opera novel. Superb characters and intricate story-telling that requires constant attention not to miss a subtle but essential point give this novel a mainstream like literary quality, without sacrificing the sf-nal sense of wonder. God willing - given Mr. Flynn recent heart-attack though he seems to have recovered nicely as detailed on his blog -The January Dancer will be followed next year by Up Jim River and hopefully more novels in this wonderful universe. It's tricky to predict awards in advance, but for my money I would put The January Dancer in contention for all major sf awards for 2008. A well-told story of galactic proportions. Interesting main characters, though almost clichés. A junior partner's crush on a senior rings false. Science as a near myth--worse a "religion"-- losing out to technology (go figure) is a nice touch. Historic figures as gods to far-distant future was well-played. Earth itself as an almost forgotten myth is good. Loved the Anycloth with embedded technology. The framing story was a good way to maintain interest and introduce uncertainty. Almost five stars. The framing story was a good way to maintain interest and introduce uncertainty. Yeah, it's been done, but it worked. I figured out who the scarred man was before the Harper did. This is my second book by Michael Flynn and he does not disappoint. I have come to appreciate his style of writting. It is true that he takes longer to tell a story than neccesary, but I enjoy the process. There are several characters to keep up with, but they are well developed enjoyable to read. He builds a universe that is vast and complex. This makes it a little hard to follow the geography, but he has a map in the front of the book. The plot is interesting and he even suprized me a little in This is my second book by Michael Flynn and he does not disappoint. I have come to appreciate his style of writting. It is true that he takes longer to tell a story than neccesary, but I enjoy the process. The plot is interesting and he even suprized me a little in the end. This is good space opra but not so traditional. It does read a little like fanasty, but it's science fiction, make no mistake about that. Gave up after the first few paragraphs; couldn't get past the precious, cliche-ridden prose used to just set the scene at a bar. Gah. A space opera tale of intrigue, mystery, adventure, and romance, all revolving about the Dancer, or the Twisting Rock, a prehuman artifact of strange abilities, and spanning wondrously detailed star systems, with a detailed back story. It opens with a harper coming into a bar -- the only bar on the planet Jehovah -- and seeking out the scarred man there for the story, so that she can make songs of it. Or so she says. So he weaves her the tale, with no less than three beginnings: a tramp spaceship A space opera tale of intrigue, mystery, adventure, and romance, all revolving about the Dancer, or the Twisting Rock, a prehuman artifact of strange abilities, and spanning wondrously detailed star systems, with a detailed back story. So he weaves her the tale, with no less than three beginnings: a tramp spaceship that found the Dancer in a pre-human ruin filled with things that could not be moved; a civil war on New Eireann; and a Hound keeping watch on the Rift for the danger of the Confederacy, when pirates came through. The Dancer complicates it all. The harper and the scarred man discuss the tale as it goes on, whether it ends well or poorly, who is the tragic hero of one portion, what are the powers of the Dancer, and an ontological mystery arising from its existence as the tale winds on through the slow formation of a group: a Terran conman and low-life, an exile from the civil war, and two Hounds searching for a contact for a Confederate agent, and information about the pirates -- and more. Mysterious disappearances of ships. A route though the stars that is not publically known. (The FTL travel in this work is particularly lushly detailed.) A corporation that owns a different pre-human artifiact, the Ouroboros Circuit. . . .
Not to mention that the discoveries that the harper and the scarred man make about each other during the course of the telling. 3.5 stars, if I could give it that. I experienced this as an audiobook and my mind wandered a bit, though it's no fault of the novel. I was just in a distracted state early on and missed some key points. I tended to lose track of the characters and the story -- however I kept listening in spite of this because of the language and the ambiance. In many ways that is why we read space opera, is it not? This work is chock full of everything one could want in a space opera. It seems to be paying a lov 3.5 stars, if I could give it that. This work is chock full of everything one could want in a space opera. It seems to be paying a loving homage to the writing style itself, especially that of the Golden Age writers and those I grew up reading from the late 50's through the 60's, especially the style Jack Williamson and Poul Anderson. The language is an over the top nostalgic mix of ancient legend and cowboy philosophy. "Love is never intentional, else why speak of falling into it?" Wonderful stuff. This is what kept me listening in spite of losing track of the plot somewhat. Other reviewers have complained of the plot jumping back and forth between the "actual" story and a bar scene where the story is being told, but I found this technique thoroughly enjoyable, essential in fact, and this also helps the work pay homage to its predecessors by giving it that obligatory legendary atmosphere. I'm thinking this is one for the science fiction book club to discuss. The January Dancer is a pre-human artifact that moves slowly and constantly, without being seen to move. It is the Mcguffin that bring all the characters in this sprawling novel together, eventually. The first scene, where the Dancer is found, is a great peek into an alien culture. The idea of Immovable Objects vs. Irresistable Force was eerie and horrifying. The novel contains several points of view, although it is really a I'm thinking this is one for the science fiction book club to discuss. The January Dancer is a pre-human artifact that moves slowly and constantly, without being seen to move. It is the Mcguffin that bring all the characters in this sprawling novel together, eventually. The first scene, where the Dancer is found, is a great peek into an alien culture. The idea of Immovable Objects vs. Irresistable Force was eerie and horrifying. The novel contains several points of view, although it is really a story within a story. The framing story is told by an old man to a bard in a bar. It's obvious that the old man is a character in the story he's telling, but which character? The interior story is an enthralling space opera, with pirates, spies, and con men. Reminded me a bit of Consider Phlebas by Iain Banks. I'm not sure how well some of the old Celtic phrasing works in this story (it feels a bit anachronistic), but hey, it's the author's universe, he can have that kind of old-fashioned phrasing if he wants. The concept of the agent/Hound is a great one, and one that I'm looking forward to reading more about in the sequel to this book, Up Jim River. I do hope that the bard character becomes more interesting in the sequel; I was bored by her in this book. Everything in the universe is older than it seems. Blame Einstein for that. We see what a thing was when the light left it, and that was long ago. Nothing in the night sky is contemporary, not to us, not to one another. Ancient stars exploded into ruin before their sparkle ever caught our eyes; those glimpsed in glowing “nurseries” were crones before we witnessed their birth. Everything we marvel at is already gone. So begins The January Dancer a modern space opera full of the action, politics, and mystery told with poetic language and deft touch. The book opens up with the appearance of a mysterious bard seeking the story of the titular January Dancer (which goes by a number of other names throughout the story) a mysterious stone that twists its shape. Thereafter the novel unfolds on two levels: the story, told by the scarred man at the harper’s behest, and the interaction between the bard and the scarred man. Both are interesting in their own right with the italicized sections detailing the conversation between the bard and the scarred man providing a kind of running commentary not only the story itself, but on the nature of stories in general. Not bad, but not my favorite book either. I can't put my finger on what it was, I enjoyed most of the characters in the story; there was lots of action; even the way the story was told was interesting enough. Maybe it was that a couple of the plot thickeners were added to late for my taste. In fact I felt the story was lacking until most of the way through the book and then it was as if it lacked what it needed to keep that level of intrigue and information going. I know, vague reasons, yet I fo Not bad, but not my favorite book either. I can't put my finger on what it was, I enjoyed most of the characters in the story; there was lots of action; even the way the story was told was interesting enough. Maybe it was that a couple of the plot thickeners were added to late for my taste. In fact I felt the story was lacking until most of the way through the book and then it was as if it lacked what it needed to keep that level of intrigue and information going. The main story is space opera in a setting where humanity has dispersed from Earth far enough to have lost contact but no so far that there's no continuity of cultures. Bonus space-opera-subversion points are awarded for ships that are hampered by the lack of port facilities. Some points might be subtracted for racism, but it might be legitimate social commentary. The frame story, however, turns it into almost a mystery, as one character recounts the events to another, subtly telegraphing future The main story is space opera in a setting where humanity has dispersed from Earth far enough to have lost contact but no so far that there's no continuity of cultures. Bonus space-opera-subversion points are awarded for ships that are hampered by the lack of port facilities. Some points might be subtracted for racism, but it might be legitimate social commentary. This review is really 3.5 stars. Some parts of this book felt messy, as if the author wasn't sure where he was going next. But overall it was an enjoyable experience in a very interesting universe. Having set up this vast universe full of barely introduced worlds and tomes of unexplored history, as well as only doing a minimal amount of "tying things up" in the end, I look forward to much more to come. Dit boek is voor de fijnproever, de denker, de science fictionliefhebber. Ik kon zien dat het prachtig is, maar bleef er zelf een beetje buiten. Het is een boek als een symfonie - neem er de tijd voor en het betaalt zich terug. Maar ik zal eerst nog wat eenvoudigere science fiction lezen voor ik bij dit soort boeken terugkeer. Becoming one of my favorite books! The audio book by Stephen Rudniki is superb! I wish he had narrated all four in the series. “Everything in the universe is older than it seems. Blame Einstein for that. We see what a thing was when the light left it, and that was long ago. Nothing in the night sky is contemporary, not to us, not to one another. Ancient stars exploded into ruin before their sparkle ever caught our eyes; those glimpsed in glowing "nurseries" were crones before we witnessed their birth. Everything we marvel at is already gone.